New research, published in PLOS Medicine, conducted by researchers at the University of Liverpool, Imperial College London, Friedman School of Nutrition Science and Policy at Tufts and collaborators as part of the Food-PRICE project, highlights the potential health and economic impact of the United States (US) Food and Drug Administration's proposed voluntary salt policy. Excess salt consumption is associated with higher risk of cardiovascular disease (CVD) and gastric cancer. Globally, more than 1.5 million CVD related deaths every year can be attributed to the excess dietary salt intake. 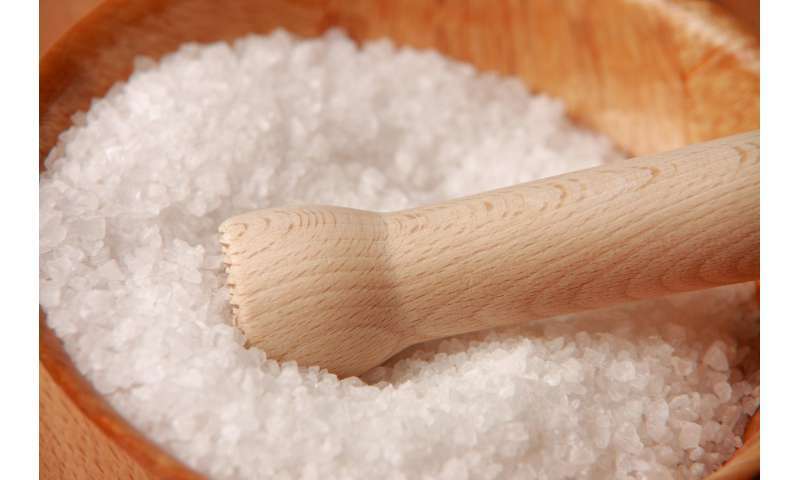 Further salt-related deaths come from gastric cancer. Health policies worldwide, therefore, are being proposed to reduce dietary salt intake. The US Food & Drug Administration (FDA) has proposed voluntary sodium reduction goals targeting processed and commercially prepared foods. The researchers aimed to quantify the potential health and economic impact if this FDA policy was successfully implemented. The results will be of great interest to policy makers. The researchers modelled and compared the potential health and economic effects of three differing levels of implementing the FDA's proposed voluntary sodium reformulation policy over a 20-year period. They found that the optimal scenario, 100% compliance with the 10-year FDA targets, could prevent approximately 450,000 CVD cases, gain 2 million Quality Adjusted Life Years (QALYs) and produce discounted cost savings of approximately $40 billion over a 20 year period (2017-2016). In contrast, the modest scenario, 50% compliance of the 10-year FDA targets, and the pessimistic scenario, 100% compliance of the two-year targets but no further progress, could yield health and economic gains approximately half as great, and a quarter as great, respectively. All three scenarios were likely to be cost-effective by 2021 and cost-saving by 2031. Dr Jonathan Pearson-Stuttard, University of Liverpool and Imperial College London, said: "Our study suggests that full industry compliance with the FDA voluntary sodium reformulation targets, would result in very substantial decreases in CVD incidence and mortality whilst also offering impressive cost savings to the health payers and the wider economy. Senior author Professor Martin O'Flaherty, University of Liverpool, said: "There is no doubt that these findings have important implications for the processed and commercially prepared food industry in the US." Senior author Renata Micha, Research Associate Professor at Friedman School of Nutrition Science and Policy at Tufts University, said: "Population-wide salt reduction strategies with high industry compliance should be prioritized to save lives and reduce healthcare costs. Industry engagement is crucial in implementing dietary policy solutions to improve population health, particularly for developing and marketing healthier foods." Other research collaborators in the project were Department of Preventive Medicine and Education, Medical University of Gdansk (Poland) and the American Heart Association (Washington). This work was supported by awards from the US National Heart, Lung, and Blood Institute of the National Institutes of Health. The content is solely the responsibility of the authors and does not necessarily represent the official views of NIH. For conflict of interest disclosure, please see the article. According to this 2011 article https://www.scien...n-salt/, the health risks of salt are largely unfounded, or not based on quality science. I wonder, was this economic study done because of new research on the health risks of salt, or old? Most people are not salt sensitive and are able to excrete excess salt with no difficulty. Our government is not likely to change its recommendations on salt regardless of studies showing salt is not a health problem.